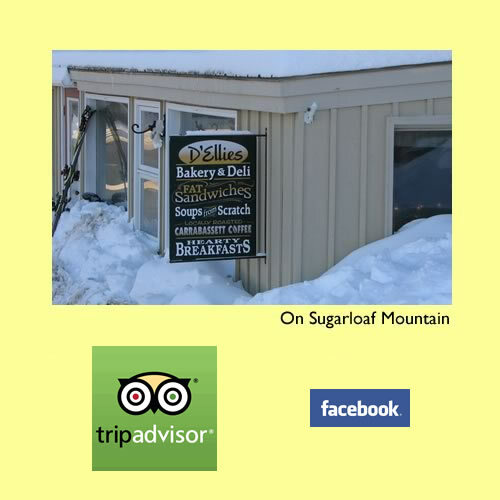 D'Ellies Bakery & Deli at Sugarloaf Mountain Maine and on the dock at Boothbay Harbor. Our mission is simple! We believe in using the freshest ingredients to create healthy food from scratch. We love what we do and even more, we love sharing it with you! Hope to see you soon! We are open Sunday through Friday 8am - 3pm, Saturday 8am - 4pm. Closed Thanksgiving, Christmas, and Easter. Closed for annual maintenance April 29, 2019 - June 12, 2019.